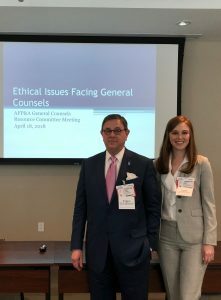 Attorneys Richard Glassman and Lauran Stimac Present on Corporate Ethics - Glassman, Wyatt, Tuttle, and Cox, P. C.
Attorneys in the Firm are available to speak to trade groups, attorney groups and more on a variety of legal topics. Mr. Glassman has been presenting seminars for lawyers on current events under the law and how not to commit legal malpractice, or what to do if you think you may have committed legal malpractice, for over 30 years. He has presented to thousands of lawyers in Tennessee, Mississippi, and Arkansas. Firm attorneys Jonathan Stokesand Ed Wallis have presented similar seminars for lawyers in Mississippi and Mr. Wallis has assisted the firm’s clients in legal malpractice matters across the states of Tennessee and Arkansas. Firm attorney Lauran Stimachas also assisted in the presentation of similar seminars as a part of her area of specialty in defending lawyers in legal malpractice and/or Board of Professional Responsibility issues.